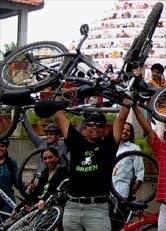 GoGreen participating in Bangalore's BSA Cyclothon. 23 Jan 2011 - GGI-Group size: 4000+ Professionals, Increasing on day to day basis, Come & join us 2 serve Mother Nature. Our day started @ 5:30am where we started assembling @ RIS junction, when i reached this place their were already quite a few members who were waiting mainly people from Banshankari had come & were waiting with thier support truck. It was then we saw more and more GGI's turning on. We were suppose to start the ride by 5:45am but we decided to hold on for antoher 5 minutes more so that we could ride along with more no of people. Finally started off by 5:50am. other GGI's started joining us inbetween junctions like Jayadeva flyover then BTM Udapi Garden, Silkboard junction, ORS junction then finally @ Marathalli junction. Reached KTPO by 7:15am as planned, we had couple of issues to get our support vehicles into the venue. GGI members distributed the BIB No and Goodies to all the other members who were not able to collect on the previous day. 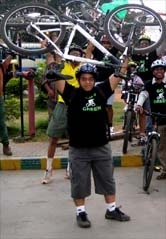 LG Green Ride was the last of all which flagged off @ 9:05am, most of them finished the 13km stretch within in 1 Hr. The best part of the ride was, their were many of them who had come on their single speed bikes and were peddling all along with us. A big thumb's up to all these GGI's who made up their mind to ride this distance. We had collected an nominal amount of Rs.50/- for those who were willing to utalize the support vehicle that was arranged by our GGI-Shilander . It was of great help both for shooting the video as well as dropping most of the GGI's at their respective places. All in all every one enjoyed the day. The total distance that was suppose to be covered from Jaynagar 5th block's RIS junction was arround was minimum 61 km (24 km + 13 km Event Ride + 24 km). artup time of 5:30am till the end of the ride which was almost 12:30pm. We from Go Green would thank them for their efforts in shooting & showcasing our team's Going Green efforts to the people in the other country. Here is what they wanted to say !! It has been a pleasure to meet you all and to discover and film the GGGC movement. We want to thank everyone for warmly welcoming us and our video camera inside of the group. 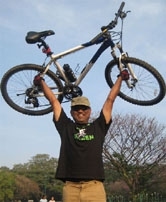 Congratulations to everyone on the positive message you are conveying by riding your bicycles. We wish GoGreen a great success and to reach out to many people. Take care and RIDE ON !! !